Greek Language lessons in Athens, Thessaloniki and Chania – Learn Modern and Ancient Greek in Greece! The School “Alexander the Great” was founded in Athens in 1972, having as an initial aim to teach the Greek language to foreigners who wanted to study in DELTA College. 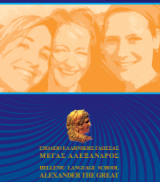 In this respect, it is probably the first school for the teaching of Greek language to foreigners. The educational programme is not restricted in usual lessons. There are also projects, individual or in groups, presentations about music, literature, mythology, history, Greek films, museum visits and evening walks at the city for dinner. Our School, because of its constant involvement in teaching Greek as a foreign language, is also occupied with the production of educational material in printed form, in the form of educational software (multimedia cd, suitable for self-teaching) and in the Internet as well. The Central school is situated in Athens, the capital of Greece, a city with almost 6.000.000 inhabitants. The School is in the city centre, next to the Archaelogical Museum, 50 metres from the park “Pedio tou Areos”, 200 metres from the Underground station and next to many bus and trolleybus terminals. The Center of Greek Language & Culture “Alexander the Great” was founded in Athens in 1972. Today it has branches in Thessaloniki and Chania and also Bulgaria (Sofia and Philipoupolis – Plovdiv). The name “Alexander the Great” has been given to commemorate the great spread of the Greek language, which followed the expedition of Alexander the Great up to India. Alexander the Great was the one to establish in Babylon the first organized school to teach Greek language and culture to non-Greeks, as stated by Plutarch. Our educational programs include visits to museum, dinning out with teachers and students, participation in presentations about Greek Culture and projection of Greek movies. Since its first steps, the school has been involved in the development of educational material for the Greek language with books and educational software (multimedia cd) through the participation in many European Educational Programs. The School has cooperated with the BRITISH – HELLENIC COLLEGE and with EURANEK as well as with ALPHA PUBLICATIONS in such projects. Our eagerness to be creative. Our small in number classes. The fact that we pay individual attention to our students. Our fully equipped, organised and modern environment. The variety of programmes offered. The innovative series of books and other educational material we offer free to our students. Our willingness to face up to the special needs of every student, by preparing special programmes. The fact that we offer knowledge about Greek history, music, culture and not just about the Greek language. The fact that we help our students live like Greeks. The fact that we like what we do – both teaching and hospitality. Our warm and honest smile as a result of the above. Strefi hill: Panoramic view within a stone’s throw of our school!